Data logging in its simplest terms is the procurement of information in order to understand and monitor a process or system. It forms the basis of an understanding of a diverse range of systems, and most importantly retrieving data from the process, which can help you achieve business goals. One of the most obvious data logging scenarios is the black box recorder in an airplane, which gathers information on the plane’s flight to be used later. Another is a weather system logger used by meteorologists to detect temperature and pressure in order to determine upcoming weather conditions. Data logging is used in a variety of situations. While data logging can be found in almost any industrial niche nowadays, one niche which relies heavily on collecting business critical data for making important decisions is any prototypical environment that requires a scale. 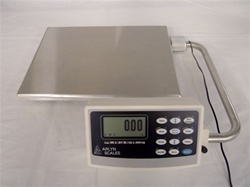 Arlyn Scales provide a plethora of USB scales, which offer a USB port for datalogging. Arlyn Scales provides an optional USB connector on their entire line of industrial scales. The same method that has been commonly used to store data on most computers now exists on such scales as ultra precision scales, digital platform scales, drum scales, floor scales, crane scales and digital bench scales, among others. Obtaining and storing data are also two fundamental functions of industrial scales. The first, obtaining data is a typical feature of most electronic scales. For example, a veterinarian can place a puppy on an animal scale and determine the weight of the animal simply by viewing the scale’s display. The veterinary scales, platform scales, floor scales, and bench scales made by Arlyn Scales boast a large graphics LCD digital display that is easy to view. Most of these digital scales even include a swivel mount for the display. This allows the user to adjust the display for optimal viewing. With a USB port available on the industrial scale, a USB memory stick or flash drive can be plugged into the scale itself. Users can store the desired weights directly onto the device. There is no more recording data by hand, which runs the risk of human error. Accurate, precise measurements are saved and stored for as long as the users deems necessary. The amount of weights stored is dependent only upon the size of the flash drive chosen. Different drives can be plugged in at different times to meet the user’s storage needs. The electronic scale also has the ability to store the date and time that a weight measurement was taken. The logging and saving of information provides for increased knowledge and sometimes improved management of how and why different processes work. The data is then archived and, once retrieved, can be filtered and properly understood. Data logging provides for the gathering of statistics which are used to give a better understanding of the field you are working in. The information is needed in all types of businesses to determine performance, quality, efficiency cost cutting, if necessary, fuel consumption, and many other vital information uses. Over the years there has been an evolution in data logging and the type of loggers that are used. In the past, the equipment was bulky and mechanical, using huge paper chart recorders. Now, sophisticated computers and microprocessors retrieve the information in far more detail than could have been processed previously. With software designed for the industries’ usage, the stored data is no longer just a set of measurements, but usable data. Users can create spreadsheets to compare data over periods of time or print reports of measurements from various databases. The information can even be downloaded and e-mailed to anyone requesting it. Thanks to the USB memory stick, the possibilities are endless, saving both time and money. Data logging is commonly used in scientific experiments and in monitoring systems where there is the need to collect information faster than a human can possibly collect the information and in cases where accuracy is essential. Arlyn Scales designs, manufactures, sells and supports industrial scales with included USB ports that allow for data logging. No matter what the niche, Arlyn will provide a scale that will fit your business needs.